Let us help you memorialize your loved ones with a natural stone, customized memorial bench. 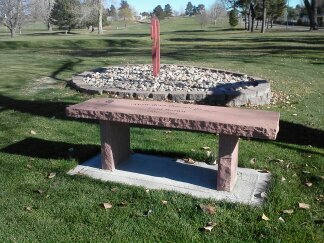 Our natural stone memorial benches are perfect for golf courses. No foundation needed and can be assembled in less than an hour. We ship directly to you. We are proud to provide golf courses with benches that will last a lifetime with little or no maintenance. Let Us Make One for You! ~ May Memorial Bench Special. We Ship Anywhere in the U.S.A. Shipping is Easy and Installation by customers takes less than an hour to complete, leaving you with the most beautiful natural therapeutic garden to honor your loved one. Perfect for any Golf Course. 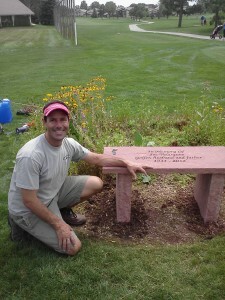 Another beautiful completed bench by Bergen Designs overlooks the 1st Tee Box! Here are a few pictures of the rooftop garden, "Tahoe Terrace East". As you can see, the benches are a nice complement to the area. Hopefully this is just the first phase and we’ll be adding more in the near future. Thanks again for getting these to us on such a short notice. There have been many positive comments and questions as to where I found the benches. I look forward to doing business with you again. Attached are the photos of Eva's beautiful bench. We placed under the Magnolia tree which already has a few buds. We also decided that this was the best place for us in our main courtyard area near the little art studio. We can also view it from inside the house through our family room French doors. Thank you for this wonderful gift that has warmed up our garden! Spring is just beginning to awaken. I will send another photo when everything is in full bloom. 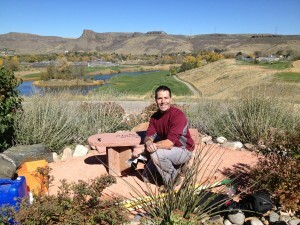 Working with Scott to create the memorial bench was a great experience. Our family is very thankful to have found him and the memorial bench he created for us. I would recommend him to any others looking for a very special and beautiful memorial bench for their loved one. We ship to any golf course in the U.S. or deliver and install to any golf course in Colorado. The text you give us for inscription is engraved into the natural stone, making these memorial benches a beautiful personal reflection of your loved one’s memory.